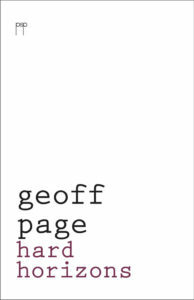 Hard Horizons is a surprising title from a poet as genial, balanced and humanly moderate as Geoff Page . . . His irony wry humour, and emotional understatement mark an aesthetic of ‘Art is that which hides art’ – in my view, the most valuable aesthetic of all. Page seems to genuinely like people, with all their foibles; who else would write of ‘the anonymity of cities / where all the streets are rich with strangers’? Above all, Gods and Uncles is a testament against dogmatism and moral censoriousness, whether it comes from gods, uncles, preachers, or paranoids – all those ‘joyously enriching death’ by arguing that ‘Annihilation’s not good enough’ for people who disagree with them. Page sets against this moral certitude a liberal humanism and a sense of fun. He is surely our best contemporary public poet; his poems work because of his humanity, his authorial poise, and the wit and intelligence that lie just beneath his light touch. Page’s humour is serious and thoughtful, as poems such as ‘Times We Didn’t Know Were Final’ and ‘Call yourself a socialist?’ make clear. His poetry is skilful and respectful of an audience, his voice reassuring even when treating tough themes. 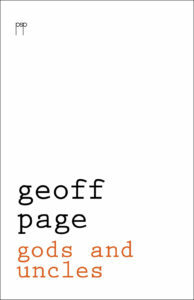 Like his ‘drip-dry’ shirt ‘bought in ’63’, Page’s book is ‘a triumph over entropy’. 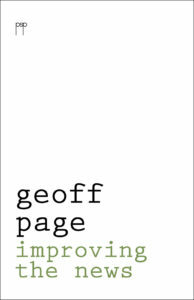 Geoff Page is an Australian poet who has published twenty-two collections of poetry as well as two novels, five verse novels and several other works including anthologies, translations and a biography of the jazz musician, Bernie McGann. He retired at the end of 2001 from being in charge of the English Department at Narrabundah College in the ACT, a position he had held since 1974. He has won several awards, including the ACT Poetry Award, the Grace Leven Prize, the Christopher Brennan Award, the Queensland Premier’s Prize for Poetry and the 2001 Patrick White Literary Award. Selections from his work have been translated into Chinese, Hindi, German, Serbian, Slovenian and Greek. He has also read his work and talked on Australian poetry in Switzerland, Germany, Ireland, Norway, Sweden, Great Britain, Italy, Spain, Serbia, Slovenia, Slovakia, Czech Republic, Austria, Hungary, India, Singapore, China, Korea, the United States and New Zealand.